Conan's quest to return a magic crown to the lands from which it came have taken a dark turn. His soldiers dead, Conan just barely escaped sacrifice at the hands of a witch who has united the various Pictish tribes under one banner. Now, to save his kingdom, Conan has forged an unlikely alliance with members of the renegade Wolf Tribe. But can Conan trust their word, even when they follow the word of his old ally, the druid Nai? With this issue, Tim Truman has journeyed well beyond the role of an adapter. Despite this, Wolves Beyond The Border feels like a long-lost Robert E. Howard script. Part of this is due to how well-placed this story is within the Howard aesthetic and continuity - indeed, this story makes mention of the events of Howard's Beyond the Black River. The greater part of this, however, is due to Truman's skill as a storyteller and his ability to spin a ripping yarn in a manner to do Howard credit. Truman is matched in skill and suitability by this series' art team. For my money, Tomas Giorello is the finest artist to work on the Conan comics in the past five years. And the colors by Jose Villarrubia are as wild and vibrant as the land of Hyboria. 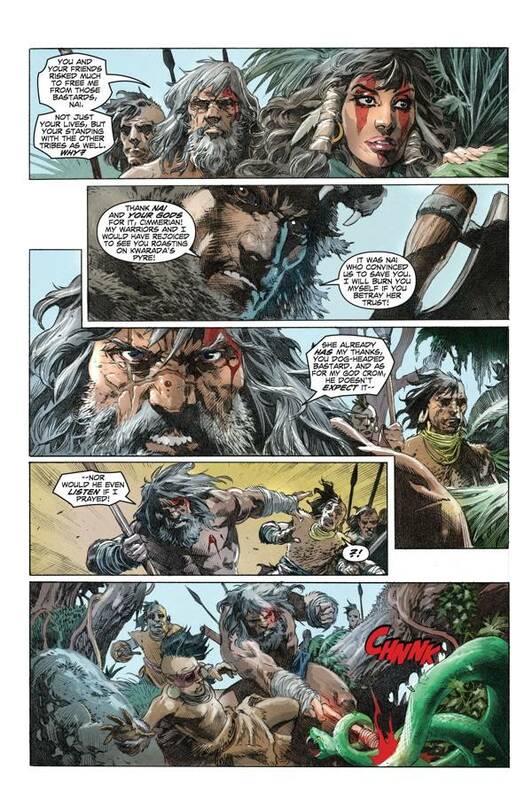 King Conan: Wolves Beyond The Border #3 is due out on 02/24/16!